Yamaha YPG-235 review - Best Choice for a First Keyboard? 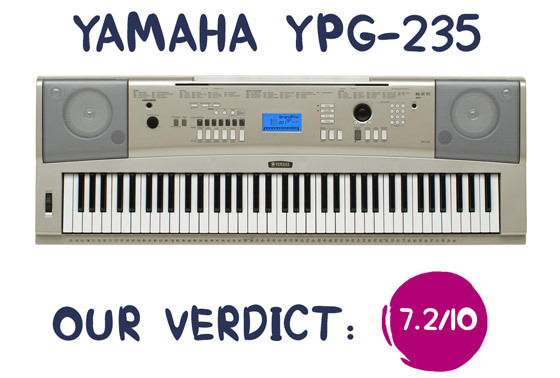 Today, we’re going to talk about the Yamaha YPG-235, the most affordable model of Yamaha’s “Portable Grand” line. The YPG-235 is a portable entry-level keyboard, which comes with 76 touch-responsive semi-weighted keys, 500 built-in sounds, 6-track MIDI recorder, and a bunch of useful features for learning and entertainment. The keyboard is a very popular choice among new players to start learning on. And we’re going find out if it’s a good choice for that. The DGX-230 is the exact same keyboard but released in other markets. The only difference is that the DGX-230 has a silver finish, while the YPG-235 has a gold champagne one. Not long ago, I did a thorough review of the Yamaha YPG-535, the YPG-235’s big brother. The keyboards offer very similar functionality (sounds, features, connections), so in this review, I will only be touching on differences between the keyboards. The rest you’ll find in the detailed review of the YPG-535. Update September 2018: The Yamaha YPG-235 has been discontinued and replaced by the new model – PSR-EW300. With shortened (to 76 keys) keyboard, the YPG-235 is even more compact and 5.7 lbs lighter than the YPG-535 (18.3 lbs vs 24 lbs). It provides more freedom in terms of mobility. You can easily move the keyboard from place to place and take it with you on trips and gigs. Just like the YPG-535, the YPG-235 is pretty deep (16.2″) compared, say, to the Yamaha NP-32, which is only 10.2“ in depth. However, the NP-32 doesn’t have nearly as many features and sounds and also has no display. So something is sacrificed anyway whether it’s the compactness of the keyboard or extra features. Unlike its bigger brother, the YPG-235 has a compartment for 6 D batteries on the bottom, so you can play the keyboard virtually everywhere without worrying about where to plug it in. The YPG-235 features 76 semi-weighted keys, which is the main difference from the YPG-535, which has a full range of 88 keys. While 61-key keyboards can be quite limiting, and if you own one, you may have noticed that 61 keys are not always enough for playing certain pieces, the YPG-235 would be a great upgrade that would expand the range of songs you can play. The YPG-235 uses the same Graded Soft Touch action as the YPG-535, which means you get the same feel and touch but with 1 octave fewer keys. 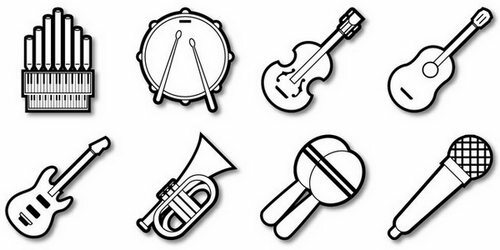 The keys are graded (heavier in the low end and lighter in the high end) and touch-sensitive (the harder you play, the louder the sound). The width of the keys differs a bit from an acoustic piano, being about 1 inch narrower compared to the width of 76 acoustic piano keys. You’ll hardly notice the difference, but it’s still worth mentioning. The display of the YPG-235 is smaller than the YPG-535’s and therefore has some limitations. The display will show your current settings such as the selected sound, style, song, mode, transpose settings, tempo, etc. 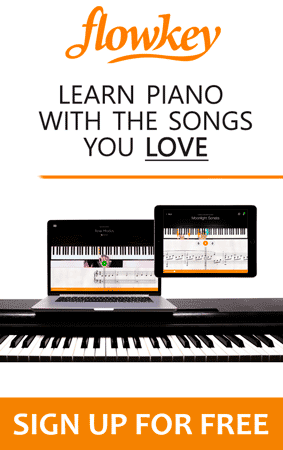 You can also use it with the Song Lesson function; the display will show the notes and the actual keys (on the graphic on-screen keyboard) you need to play. Unlike the YPG-535’s, the YPG-235’s display is not capable of showing the scores and lyrics of songs due to its smaller size. When it comes to sounds and features, the YPG-235 and the YPG-535 are nearly identical. 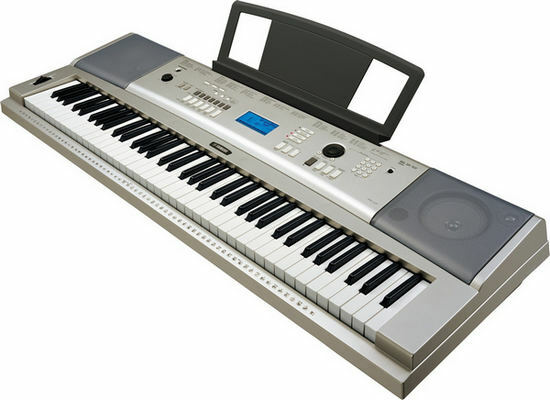 The keyboards offer the same sound effects, styles, and internal songs as well as educational features including the Yamaha Education Suite and the Performance Assistant. At the same time, the YPG-235 has 11 fewer instrument sounds (489 vs 500) and slightly different performance assistant with two selectable types (the YPG-535 offers four types). In addition to that, the YPG-235 has 373 KB of internal memory and allows you to transfer to the instrument up to 256 files (MIDI songs, styles, etc. ), while the YPG-535 has 875 KB of internal memory, and up to 512 files can be transferred. That’s pretty much it when it comes to differences between the two here. The YPG-235 has all the same connectors the YPG-535 has except the USB to Device port. It means you won’t be able to plug in a USB drive directly to the keyboard to exchange MIDI songs. However, you still can connect the keyboard to a computer using the USB to Host port (USB AB cable is required) and exchange songs, files, and use the keyboard as a MIDI controller with music apps, such as GarageBand, Logic Pro, FlowKey, etc. When it comes to accessories coming with the keyboard, the YPG-235 is very basic. The package includes only a Music Rest, Owner’s Manual, and an accessory CD with drivers and additional songs. That’s it, no matching stand and even no AC adapter. However, for an extra 30$ you can get the YPG-235 Standard Pack , which includes not only the Yamaha PA-150 AC adapter but also an X-type stand and headphones (pretty crappy though). Alternatively, you can buy an AC adapter and all the necessary accessories separately, so you’ll be able to choose the ones that suit your needs and have great quality. Yamaha did a great job with the YPG-235 and no wonder it remains one of the most popular keyboards of the company. Being on the same level with the YPG-535 in terms of sound, features, and connectors, the YPG-235’s price is twice as low as its 88-key brother’s. 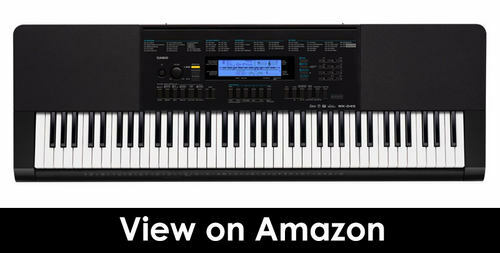 The keyboard would be a great choice for beginner players and musicians of all ages. The YPG-535 comes with the Yamaha Education Suite and some other great educational features, which will make it easier and more interesting to learn. Even a bored of practice routine kid will find something fun on the YPG-235 with its 489 built-in sounds (including 6 pianos), 100 songs (for listening and practicing) as well as the useful lesson features and the easy-to-play Performance assistant. Another great thing about the YPG-235 is its portability. It goes without saying that the keyboard is lighter and smaller than its 88-key competitors, so it’s much easier to carry the YPG-235 around and play out. You don’t even need a second person to help you; the keyboard is light enough for one person to lift. In my opinion, the 76-key keyboard is a “happy medium” for a beginner. Such keyboards are cheaper than 88-key ones but at the same time aren’t as limiting as 61-key keyboards can be. However, if you’d like to play a lot of classical pieces, chances are that some of them will require a full-length keyboard for proper performance and in that case, you’d be better off with an 88-key instrument (preferably with hammer action keys). The YPG-235 is quite easy on the wallet and will save you from overspending until you’re committed to playing for years to come. At the same time the YPG-235 has more than enough bells and whistles that will keep you busy and interested for hours, that’s for sure. There aren’t actually many 76-key keyboards on the market to compete with the YPG-235 , but there are still some great alternatives to consider. As I said, the keyboards have a lot in common. All the differences I’ve covered in this review and the rest you can find in the detailed YPG-535 review . The main advantage of the YPG-535 over the YPG-235 is its 88-key keyboard and USB to Device port. If you’re a beginner, you probably wouldn’t need the full range of 88 keys, since it’s only necessary for playing some complex (classical) pieces. At the same time, the 76-key keyboard would allow you to play 99.9% of modern pop/rock/jazz and most classical pieces. As for the USB to Device port, well it’s a convenient feature to be able to record and save your performance (SMF format) directly to the Flash drive, but it’s definitely not irreplaceable. I mean, you can always use MIDI software on your computer to record and edit songs using the YPG-235’s USB to Host terminal. Another thing to point out is that the YPG-535 comes with a nice matching stand and an AC adapter, so the keyboard is ready to use right out of the box. But don’t forget that the YPG-535 is almost twice as expensive as the YPG-235, which doesn’t come with those accessories. The NP-32 is an elegant 76-key keyboard with a minimum of features and a wonderful piano sound. Unlike the YPG-235, the NP-32 doesn’t have hundreds of instrument sounds, sound effects, styles, and rhythms. It’s designed to be very simple and straightforward so you can concentrate solely on playing. The keyboard is extremely compact and lightweight (only 12.5 lbs). It has 10 beautiful sounds and all the “basics” such as a metronome, Dual function (layering), Transpose function and a 1-track MIDI recorder for recording and playing back your own performances. The NP-32 features the same Graded Soft Touch keyboard and the AWM sampling technology as the YPG-235. However, the NP-32 offers twice as much polyphony as the YPG-235 (64 vs 32 notes), which allows for richer and fuller sound when playing complex music (and especially when using the sustain pedal). You can use the NP-32 as a MIDI controller since the keyboard is equipped with a USB to Host terminal to connect to a computer. Basically, the NP-32 is the YPG-235 but without those extra features, sounds and effects that would be unnecessary for a piano player. So I’d recommend this keyboard if you’re a beginner and you primarily need a keyboard for piano playing and not for creating and recording multi-layered music or playing with an accompaniment, etc. However, for piano playing, I’d seriously consider investing in a keyboard with fully-weighted keys, which mimics the hammer action found on an acoustic piano, unlike non-weighted and semi-weighted actions. 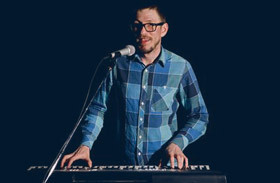 The Yamaha P-45 is Yamaha’s cheapest keyboard with hammer action keys. The Casio WK-245 is actually the direct competitor to the YPG-235. Both keyboard feature 76 spring-loaded touch-sensitive keys (semi-weighted), a display, and a whole world of sounds, styles, rhythms, songs as well as various features for music making, learning, and just for fun. If you wanna know how the keyboards sound and feel compared to each other in terms of piano playing, I’d say that they’re very similar. The WK-245’s piano tones sounded slightly more natural to my taste, while the keys felt better on the YPG-235, but again it’s just a matter of personal preference. The WK-245 also offers slightly more sounds, features, and connectors. In particular, the WK-245 has 600 built-in instrument sounds (up to 8 sampling tones), 152 songs (up to 5 User Songs), 180 accompaniment styles, and various sound effects, including the unique Virtual Hall feature for making the sound bigger and more spacious. Just like the YPG-235, the Casio has a 6-track MIDI recorder, Layer/Split Modes, and a Step up lesson feature to help enhance your playing skills. In addition to that, the WK-245 has an Audio In and Mic In jacks, which the YPG-235 doesn’t have. The Audio In jack will allow you to connect your smart device (e.g. MP3 player, iPhone, etc.) to the WK-245 and play it through the keyboard’s onboard speakers. The Mic In jack is used to connect the microphone directly to the keyboard to sing along with playing and can also be used for sound sampling (creating new tones). Generally, the keyboards have a very similar value proposition, exept that the WK-245 has an arguably more attractive design, slightly more features and a lower price.